Chris Shelton Book Signing Event! is guaranteed to bring balance in your life! Join us for refreshments, and an introduction to our new classes! Mark your calendar, plan to come celebrate with us! We hope you are well. There is so so much we want to share with you. We’ve been buzzzzzing (even more that usual). The past few weeks have taught us how to be more like water. Our trip to Tampa, FL was canceled less than 24 hours before we were leaving. We had been preparing for months. Chris was suppose to give 4 talks to ~500 health & fitness professionals from around the world. It was our motivation for finishing the book. We were shocked to find out it was canceled. But after we got over the initial disappointment, we decided to take a small vacation to the central coast. You’ll be glad to hear that we’re taking some time to refresh, regroup, refuel. We’re excited to tell you about all the new and cutting edge programs we will be presenting! Qigong is the Chinese art of working with the b ody’s energy system. It includes meditative practices and physical exercises. It is “Chinese” because it is based on Chinese ideas of how energy flows in the body; these same theories are at the basis of Chinese medicine, including acupuncture, and also other Chinese arts, such as feng shui. 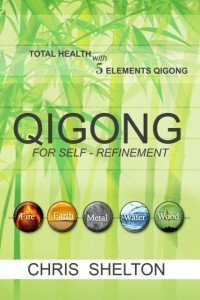 What makes this book different from many other Qigong books is the same thing that makes Chris’ teaching different from other Qigong masters. It acknowledges and provides exercises for addressing the emotional component in our modern diseases. In the past, people’s problems mainly started on the physical level: poor hygiene, danger, infectious diseases, accidents. But today, in our relatively safe, clean environment, more of our diseases begin on the emotional level. A dear friend dies, you lose your job, you are abused, or a good friend betrays you…. Strong experiences generate emotional energy. If we don’t process this energy appropriately– if we don’t digest it, just as we digest food, allowing it to transform– then it unbalances our entire system. These imbalances or blockages are not corrected, they get worse and eventually become physical symptoms. At that point, if you eliminate the physical symptom but not the underlying subtle energy disturbance, then the symptom will come back-or you will get a new symptom somewhere else in the body (Just like with the plumbing in your house, if you stop water flow, the pipe will burst somewhere along the way). Because Qigong harmonizes the subtle energy flow in the body, when it corrects imbalances at those levels it can eliminate both the physical symptoms and the emotional symptoms which caused them. The problem really goes away. This may seem like a miracle, but each success just proves that the Chinese theories are true. Join a class, read the book, try the exercises—and see for yourself! Click here to order the first copies! Upon check out type promo code 1111 and receive 10% off before July 9! Or come by Morning Crane to pre-order your copy today! Simple yet effective, the practices in this book will help you get your energies humming. Beginning with a clear explanation of the fundamental concepts of Chinese medicine, the book presents simple meditations and traditional physical exercises based on this theory. Regularly practicing these exercises will lead you into greater awareness of your body, and gradually restore your health from the inside out. The Five Element Questionnaire will help you know your personal Element type so you can target your exercise program to your own needs. Summer is here-FINALLY, the kids say! Days lengthen. Gardens surge. Days warm but nights are still cool. Kids are off school-traffic improves! Vacation spots beckon Before you leave, join us for class so you’ll look and feel your best in your bathing suit wherever you go! tion (yin). With our strong sun, summer heat, and the irresistible temptation of summer sports, we must be careful to keep our Fire in check. h in the Five Element chart and in our bodies! Sip, rather than gulp, what you drink. A dilute solution of honey, lemon and a pinch of sea salt will help supply your body with liquid as well as sugars and electrolytes. 2) Eat appropriately for the season. Smaller meals, especially during the heat of the day, will be easier to digest. Fruits of the melon family (cucumber, zucchini, water melon, cantaloupe) will help your body stay hydrated naturally. Include the bitter flavor in your diet. Bitter flavor stimulates the Fire Element; bitter foods include certain lettuces, and, in particular, bitter melon. Available in Asian groceries, this nubbly green melon is particularly consumed at this time of year to help the body deal with heat (stir-fry with beef and black bean sauce, or curry it). 3) Pay attention to your body, especially for signs of excess heat. If you feel your heart racing, which could be one sign of heat exhaustion, immediately get in the shade, lie down, and massage the tips of your pinky fingers. This stimulates a point on the Heart meridian that will help normalize heart rate. Finally, looking ahead to July, the Sheltons are gearing up for the Internal Fitness Professional Association’s annual convention in Tampa, Florida. Chris will give four presentations covering face reading, nutrition, qigong and naturally proper posture. We look forward to meeting new people and sharing Chinese secrets of health and vitality with the professionals who can then help millions of others. 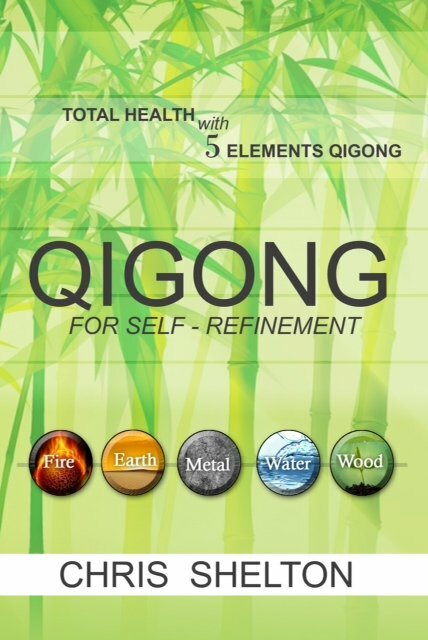 Our goal is to make Qigong a household practice, giving everyone the power of self-refinement! To EveryONE who has a Mother! We celebrate two very special holidays in May: Mother’s Day, and Memorial Day. Both remind us to give thanks to those who have made our lives even possible. First, we should especially acknowledge those who birthed us and raised us, who cooked, clothed and fed us. With the same awareness, we may also give thanks to any who have “mothered” us along our way. Nurturing is an art in itself! Secondly, we should pause to offer gratitude to those who have gone to battle to protect us. They have sacrificed much. Let this gratitude and appreciation propel you forward to make the most of your life and your resources. In Chinese medicine, May is the heart of the Spring season, the season of the Wood Element. Those who have taken our Qigong classes know what that means! Wood Element is about birth, growth, determination, and drive. Like a young green shoot pushing up through the soil, respond to this seasonal flow and “get s**t done”! Know your dream? Start now to make it happen! Not one to preach but not practice, Chris is following his dream of becoming a bestselling author and world renowned proponent of Chinese medicine. 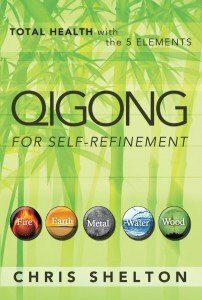 Our first book, “Qigong Self-Refinement Course” will be published by Balboa Press this summer. We hope to have copies to take when we go to the International Fitness Professional Association convention in Florida in July. In any case we will launch the book with a celebration at the Center. Stay tuned for that! If you are reading this you are taking steps to improve your well-being. Congratulations! This month we focus on clearing and cleaning. Spring into Shape means starting a new routine; making time for yourself, family, & friends; work less–play more. This is the time when the Liver is most active. Just like flowers are blossoming so is the Liver working to detoxify from the past year. Add berries to your diet. It is not by accident that nature produces berries at this time of year. Berries are know to aide in detoxification. Avoid being exposed to too much wind. At this time, the Liver is more susceptible to wind, which is the driving force for all disease. Wind is consider one of the “six evils.” The Liver stores the negative emotions of anger, frustration, and rage. The positive virtues of kindness and compassion. Take an extra moment to do something nice for the people you love or a complete stranger. Spring is a time for birth! This Spring has an incredibly evolutionary component. We are in the midst of powerful forces that are asking us to be conscious of how our choices and actions affect others. If you pay attention you will be able to see the big picture, accessing the subtle realms for guidance. This will help you to see where you can transform disempowering beliefs about yourself and the world at large. It is a time to choose your battles wisely, and to allow the Sacred Feminine and Masculine to show you a more peaceful way to proceed through your life. When we work with these archetypal energies they teach us how to experience more balance in our work. Dedicated to increasing the health awareness of all. Spring’s in the air: Out with the old, in with the NEW! It’s time to clear out your winter coats and pull out your short sleeves and sun glasses. With the seasonal change there is shift in you and around you. Spring is a time of rejuvenation, a time of birth. A time of NEW beginnings. It is the time when Green fills our eyes; from the sprouting of new seeds, to the bulbs opening to reveal their beauty. The Spring Equinox on March 21, indicates a time when the length of the day and the night are the same. It is a point of Balance. A point where the Earth is awake, and the rhythm of the year picks up. In Chinese Medicine, we make the shift into the Wood Element. During this time the Liver is most active. Like the blossoming of flowers, the porous liver blossoms and pushes out toxins that were stored during the winter months. This is a time when allergies are rampant. Your allergies are a reflection of the underlying imbalance in you Liver. Balance your Liver with foods like Reishi and Shiitake Mushroom, Cocos, and Milk Thistle. Spring is represented by the direction of East, of new visions, new beginnings, where the sun rises, and illumination and inspiration begins. It is where the spoken word is honored, especially in prayer and intention. This is a powerful time to watch both your thoughts and your words. Use them wisely to create the world you want to live in. Be conscious that they are holding the intention for the highest good. Fill yourself with thoughts that carry love, compassion, generosity and kindness. As Spring arrives, a new sense of awareness brings change and understanding. We emerge like a blooming flower. 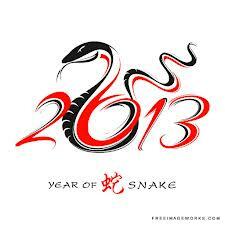 written in conjunction with Maggi Quinlan, Ph.D.
How will the Year of the Snake Fair for YOU?! The Snake, and its complementary sign, the Dragon, together form the House of Mystery; but whereas the Dragon is the gaudy magician, the Snake is the contemplative mystic. A correlative of this mysticism, however, is secrecy; and the Snake is closely associated with plots and counter-plots, scandal and corruption, the expression ‘long snake’ in Chinese meaning ‘intrigue’. On the more positive side, the Snake is regarded as the guardian of treasure. Indeed, some Chinese believe it to be unlucky to kill a snake which enters the house, as it could be the bringer of good fortune. This is a time to re-consider the course of events which began in the previous and frenetic Dragon Year. It may mean that now one should back away from increasingly tense situations, and review schemes which may be on the point of running off course. There will be back-biting and malice in the air, rather perversely due to the fact that this is generally a stable, calm and peaceful year, with congenital meddlers having little else to occupy them. In personal matters, it would certainly be unwise to engage in any kind of activity which would provide ammunition for purveyors of gossip. The Year of the Snake is also a dangerous one for governments, who can be overthrown not only by revolution or the ballot box, but by the machinations of factions determined to embarrass those in power. But whatever political conspiracies there maybe, the coming of the Snake Year is likely to indicate an improvement in the financial position. Socially, the period is marked by an increased awareness of the needs of the environment: and a general war against the ravages of industrial encroachment on to the countryside will be matched in the cities by endeavors to improve the appearance of public places. Generally, it is a time for refinement and artistic progress, revealed in fashion by a welcome trend towards grace, elegance, and economy of line, rather than the garish, startling decorating architectural elements, sculpture, etc., in a variety of colors, which are often a feature of Dragon-style. This is a year of limited progress for those born in the Year of the Rat. Matters will proceed much more quietly during this year than in the last; and indeed, such advances as are achieved will be the results of careful planning in the past. It is important to continue to save this year, for leaner days ahead. The Year of the Snake is a splendidly successful time for the usually staid Ox-type. There are opportunities for social advancement, bringing a wide variety of new friends experiences: and business prospects are sound, with an additional sign of honor and recognition and for an achievement in some other field. For those thinking of marriage, the time is very auspicious, with a likelihood of younger partner. This year will not be easy for the Tiger-personality who is used to making headway without much opposition. Obstacles are likely to present themselves in the form of bureaucratic hindrances and legal tangles. Money may not be readily available, and there could be undue expense involving other people, perhaps through assisting members of the family, or an illicit affair which will prove costly. The year will not be without its anxieties, and health may suffer as a result. On the positive side, some unexpected financial gain is indicated. This year augurs well for the naturally cautious Hare. Careful budgeting and an eye for value has ensured that the Hare has the resources to make some very shrewd business dealings. In personal relationships, however, the Hare is less careful and could well be the focus of gossip. However, the Hare cares not one whit. This year, many of the Dragon’s more elaborate schemes and plans bear fruit, including those that were the object of derision when first mooted. The proof of considerable investments lies in their returns, which will vindicate the Dragon’s faith in all such projects. While fully satisfying, the year will lack any great excitement. This is the peak time for people born in the Year of the Snake, the stage is set for a grand entrance. The Snake’s ambitions not so much monetary or romantic, but personal status; and here at last, comes the acclaim and recognition which has been elusive for so long. The Snake will be introduced to people of high standing, and those in the public eye will be accorded the most favorable criticism. Finances should be more stable than before, and business prospects are extremely sound. Career women will find this a very successful period. Is only a moderate year for those born in the Year of the Horse, and progress may seem slow. It is a period of stability rather than expansion, allowing the Horse-type an opportunity to establish firm foundations for future dealings. There are no remarkably outstanding business projects and romantic affairs are marred by jealousy. On the positive side, the time is favorable for making improvements in the home. This is a happy year for the Sheep-personality; one in which events go well in all spheres of activity. Travelling with a group for a specific purpose, such as a research project or a convention, is likely, as is involvement in committee or voluntary work. Those involved in the arts, particularly music, will find this an extremely rewarding and creative period. The Monkey has to be particularly careful this year. Methods which have worked successfully in the past may have outlived their usefulness, and the Monkey could find formidable opposition in both business and romance. Financial deals fall below expectations, and an outsider maybe given the promotion that had been expected. Personal relationships suffer, and an infidelity may lead to a break-up. For those born in the Year of the Rooster, this will prove to be an exceptionally successful year, since the Snake shares many of the Rooster’s own preferences and priorities. Normally outgoing and forthright, the Rooster may decide to adopt many of the methods used by the Snake – discretion, tact, confidentiality – to make a considerable advance into the opposition’s territory. Romantic affairs are highlighted this year, whilst finances are much more secure. This is a moderate year for the Dog-personality, with the promise of financial security, but with a few worries still standing in the way. Fortunately, the position is becoming increasingly stable. Personal relationships jog along unremarkably. This would be an ideal period to start planning ahead, or to save for some ambitious project which can be put into effect next year. For the moment, however, large-scale projects are best left to one side. Domestic bliss is rudely shaken this year by a number of unfortunate episodes. A previously close-knit family may suffer disruption due to certain members failing into disgrace, or being the target of gossip and scandal. This will not unnaturally cause great anxiety to any caring parents born in the Year of the Pig. Health to may be an area for worry and it may be necessary to heat up some savings. However, the pig is resilient and robust and will as ever cope with this. February is the month of Love, love, Love! Gung hay fat choy (Happy New Year in Chinese)!!! Last month we discussed awareness, this month we discuss LOVE! @ Morning Crane we love LOVE! In Greek there are 3 words for Love: Eros, is romantic love, Philia, is reciprocal love among friends. (Philadelphia) (Philia/Delphi [Delphi means Womb]) Eros & Philia are focused on others. The 3rd type of Love is AGAPE. Agape is an overflowing love that is unconditional and seeks nothing in return. This is the type of love that creates miracles and changes the world. Love is Life, Life is Love. Sound simple? Perhaps not. Agape resides deep within you. It is the Life Force Energy (Chi) that emanates in all living things. It keeps our heart beating and breath flowing. We all have access to it. Yet accessing it is the most powerful work you will ever do, and the most challenging. Why is it so challenging? Because of the natural cynicism of our minds. “Oh that’s just airy-fairy stuff.” or “Nobody loves me, so why should I bother.” Sound familiar?! Your critical mind will do everything it can to keep you from experiencing the fullness of your potential. It will prevent you from gaining contact with the Love that is the source of Life within you. Feeling Unconditional Love does not mean that you are going to always have a beatific smile on your face while you are being faced with decreased income, loss of home, or difficulty in your relationships. The Love we are talking about is not syrupy, sweet, and blind. It is the deepest essence of your Being. It requires practice and discipline. Learn how to return to this as your home base, no matter what you are confronted with. This will be the most rewarding transformation you will ever experience in this Life. Change your life in ways you never imagined possible. Ask yourself: What can I do today that gives back to me? What actions can I take to show a bit of appreciation towards myself? Where can I go that is going to uplift me and make me feel good now and tomorrow? First of all, it is necessary to recognize the uncomfortable feelings you are holding onto about yourself. Come into contact with any judgments, criticism, self-loathing you may be experiencing for yourself. Notice anyway you move away from these feelings, the way you avoid this part of yourself, because you make the very presence of these feelings wrong. It’s a vicious cycle: Judging the judgments. Now, for just a moment, sit quietly, and breath into this discomfort, no matter what it contains. This is not a moment to figure it out, analyze or resolve anything. It is a moment to be present with your own vulnerability and pain. To allow the heart to open it is necessary that we bring an energy of tenderness, caring, kindness, gentleness; in essence, we must meet our self with compassion and accept who we are. Breath into your heart, notice any tension. Let your breath melt the tension and leave your body. Keep doing this until you feel a loosening of your heart, an opening. This opening is what allows Love to flourish inside of you – Go for it! Enjoy!!! With Love anything is possible. Buckminster Fuller, one of the great humans of our lifetime said “The quality of your life is determined by the questions you ask.” So perhaps instead of asking “What’s wrong with me?” try “What’s great with me? It’s January and we are beginning to live the New Year of 2013, and according to the Mayan elders, we are entering into an era of New Consciousness. We are here to witness the awakening of our consciousness in each and every individual on the planet. We are opening a door to a new era of possibilities, to a new era of Creation. In order to do that, it is important that we learn how to both allow ourselves to know how our mind distracts us from the Truth of Life, and also how to forgive ourselves for whatever our experiences have been in life that may have created wounds that prevents us from living the full experience of our potential. Don Alejandro, a well-respected Mayan elder acknowledges that for his people this is the end of a 5,200 year cycle. The biggest shift will be from masculine to feminine leadership & power. Feminine leadership is the type of power that supports and encourages empowerment of EVERYbody. A type of leadership that experiences no threat or need to protect one’s power from others. The need to protect often creates great stress for our systems, and can lead to deep illness. We live in a world painfully out of balance, where the needs of corporations have dominated over the needs of people. Especially in the realm of food and health, the distortion of what is important has led us to become sick, obese, and obsessed with chronic materialism as the guiding beacon for how to live life. At Morning Crane, this month is all about AWARENESS. It is time to be more aware of what comes out of your mouth and into your body. It is time to reflect on your behaviors, and decide which behaviors are benefiting your life and which are preventing your forward progress. To support this movement into New Consciousness, here is an exercise from Dr. Jean Houston, one of the leading visionary thinkers of our times:”Every day take a piece of paper and divide it into 3 columns. On top of the first column, you ask: What do I want from the Universe? Allow stream of consciousness to arise and write it down. In the 2nd column ask: What does the Universe want from me? And in the 3rdcolumn, What do the Universe and I want together?It is from this place that we find deeper meaning about ourselves, for ourselves, for our community, and for ALL people. We, at Morning Crane, are here for you!!! We will hold the bigger vision for your healing while you are growing into it for yourself. Our mission is to support you in every aspect of healing for you and your family. Let 2013 be the year when you grow into your New Consciousness. Let this month of AWARENESS be the first step.